Philly Cheesesteak Egg Rolls are America’s favorite sandwich cocooned in a cheesy, crunchy egg roll! 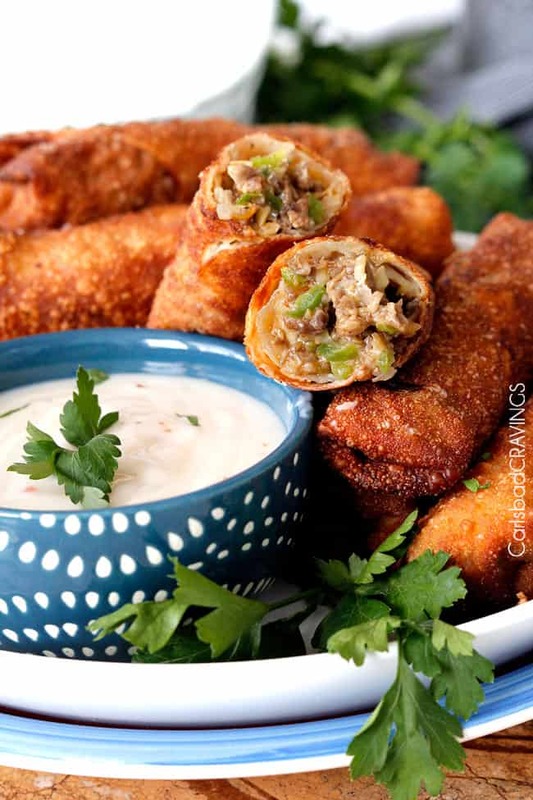 This Philly Cheesesteak Egg Rolls Recipe might just be the most addicting way to devour Philly Cheesesteaks – or Egg Rolls – Ever. 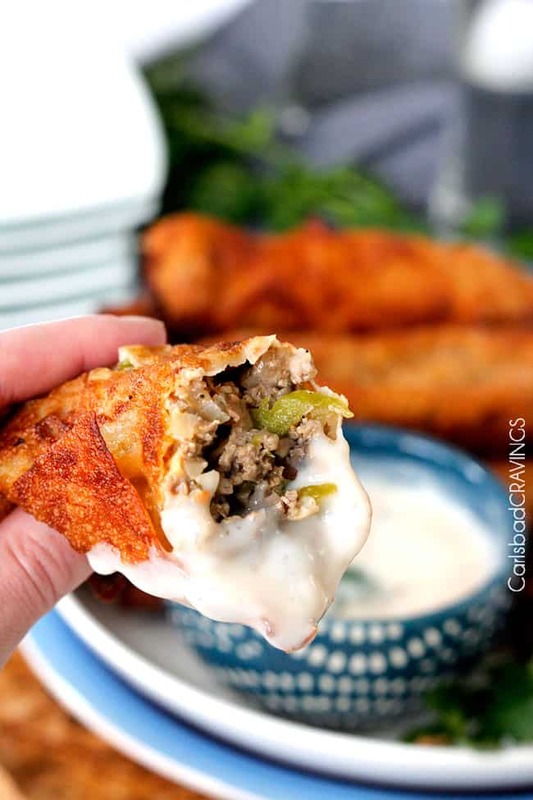 The egg rolls are stuffed with juicy steak, bell peppers, mushrooms and jalapenos smothered with cheese then fried (or baked) to cheesy perfection. They make the perfect melty, cheesy snack or party appetizer or even fun dinner! These Philly Cheesecake Egg Rolls also freeze super well (instructions included) for a quick and convenient heat and eat meal, snack or appetizer! 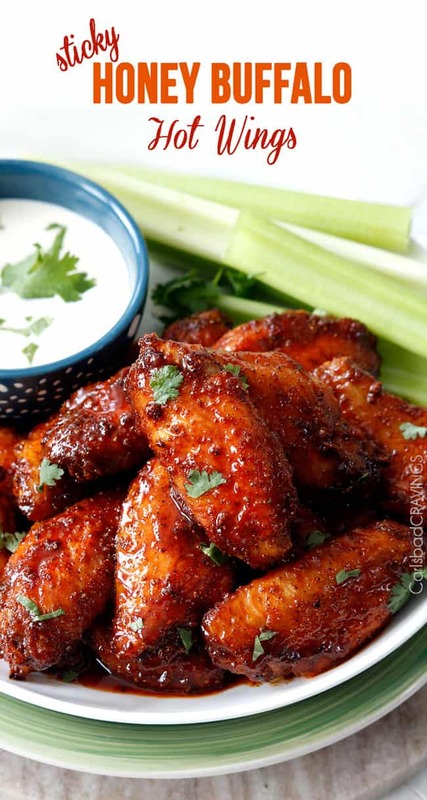 With football season upon us, it is ALL about the Game Day Food! In other words, it is all about Philly Cheesesteak Egg Rolls, Slow Cooker Honey Buffalo Meatballs, Jalapeno Popper Dip, Buffalo Chicken Dip (Stuffed French Bread), Bacon Ranch Cheese Ball – with football on the side. Even if you’re not a football fan, you will not be able to stop cheering for these Philly Cheesesteak Egg Rolls. They are basically a fusion of America’s greatest sandwich with China’s greatest finger food which makes them the MVP of appetizers. 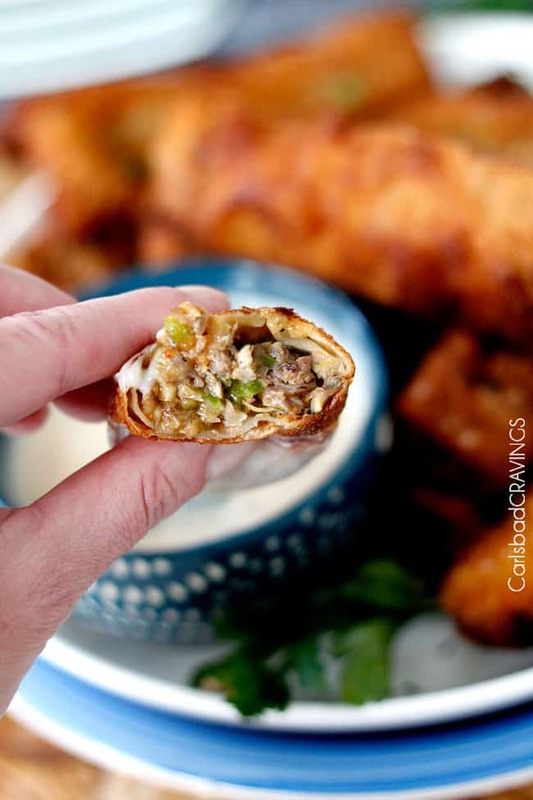 This Philly Cheese Steak Egg Roll recipe is deceptively simple to make. 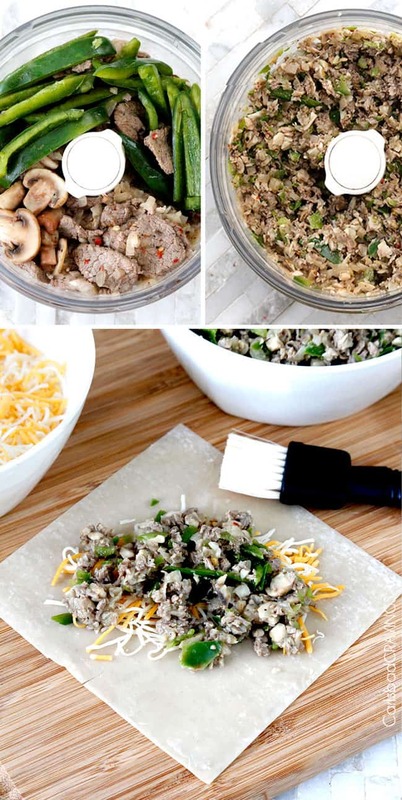 Once the steak has been marinated in pantry friendly ingredients, all you do is cook the steak, onions, bell peppers, mushrooms and jalapenos, transfer them to your food processor for a quick chop and you have 10 minute filling! Seriously, I am SO in love with this quick and easy food processor method – and you will be too! Next, add the filling to the center of your egg roll wrappers, roll up and either bake or fry – then EAT! And with each juicy, cheesy bite, you will be winning all over again. These Philly Cheesesteak Egg Rolls are a runaway touchdown that will have you on your feet celebrating their deliciousness. Or, for the more subtle type, reaching for egg roll after egg roll, after egg roll. They are everything you love about traditional Philly Cheesesteak Sandwiches but cocooned in a tantalizing crunchy wrapper. Philly Cheesesteak Egg Rolls are stuffed with marinated steak, bell peppers, mushrooms and jalapenos smothered with cheese then fried (or baked if you prefer, but for these I totally recommend fried) to melty, cheesy, perfection. These Philly Cheesesteak Egg Roll boast the same tender meat used in traditional Philly Cheesesteak sandwiches – rib eye. We marinate the rib eye in zesty Italian Dressing, onions, garlic, Worcestershire sauce, salt, pepper and red pepper flakes. You may also substitute the rib eye with more economical flank steak if you wish. Absolutely! You can substitute the steak for chicken to make CHICKEN Philly Cheesesteak Egg Rolls. You will want to treat the chicken just like the beef and thinly slice it across thee grain to marinate it. 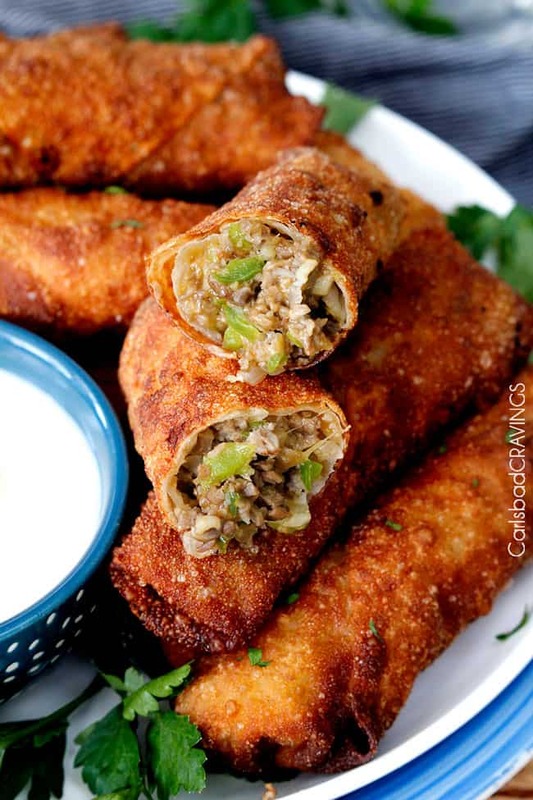 These Philly Cheesesteak Egg Rolls are super easy to make! The marinade is a quick whisking of ingredients then adding your beef. You can marinate the steak for as little as one hour and still achieve flavorful beef because the steak is already sliced thinly, but of course, the longer you marinate the beef, the more flavorful it will become. Step 2: Cook Steak and Peppers. Heat a large skillet on high heat until very hot. Add steak/onions/marinade and let cook on one side without disturbing, then proceed to cook until meat is cooked through. Take care not to overcook your steak so it remains tender instead of tough. Once cooked, transfer meat and onions to a fine hole strainer/sieve and remove any excess liquid by pressing down on the meat mixture with a spatula. This last step is super important because excess liquid in the Philly Cheesesteak Egg Rolls will result in a wet and soggy wrapper which means it will likely tear when folding or cooking. Wipe out the now empty skillet and add 1 tablespoon olive oil. Heat over medium high heat then add mushrooms. Sauté for 3-5 minutes or until golden. Remove to a paper towel lined plate. Heat another tablespoon olive oil over medium high heat and add green pepper and jalapeno. Saute for 1 minute. Now for my secret shortcut to create the EASIEST egg roll filling without having to do any hand chopping – chop the filling with your food processor! I use this trick in my Southwest Egg Rolls, Sesame Chicken Egg Rolls and Sweet and Sour Chicken Egg Rolls because it literally takes seconds and creates the perfect texture every time. If you don’t have a food processor, you can certainly chop by hand- it will just a little longer than a few seconds. Step 2 – Add Filling: Position an egg roll wrapper with one point towards you. Line the center with 2 tablespoons cheese and top with 1/4 cup steak mixture. Step 4 – Seal: Moisten top corner with egg wash press firmly to seal. Repeat with remaining wrappers and filling. If your egg roll isn’t properly sealed, it will leak when cooking, so make sure it’s secure! 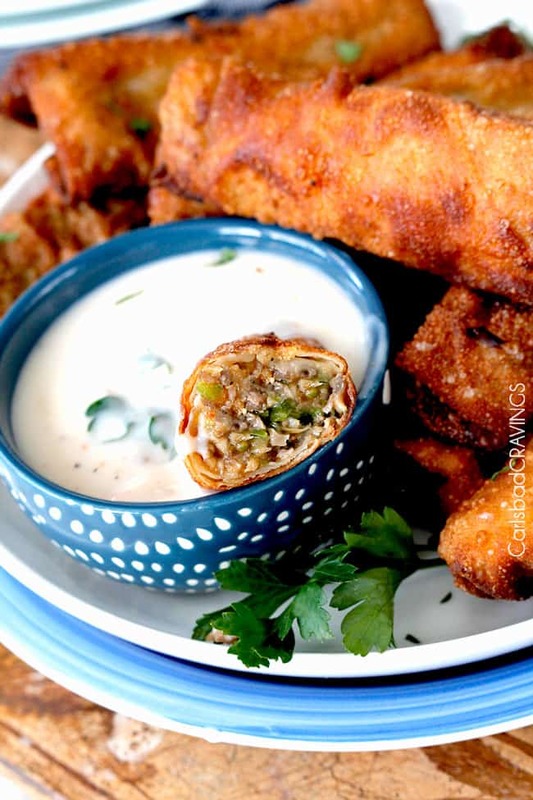 You can Bake or Fry these Philly Cheesesteak Egg Rolls BUT only fried egg rolls produce the quintessential, tantalizing, shatteringly delicious, crispy egg roll crunch. 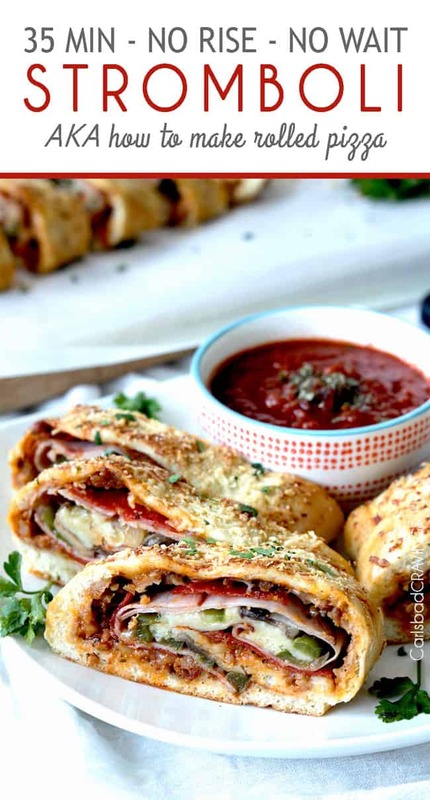 Baked Philly Cheesesteak Egg Rolls are still are still crispy-ish and delicious because of the delectable filling, but a different type of textural delicious. 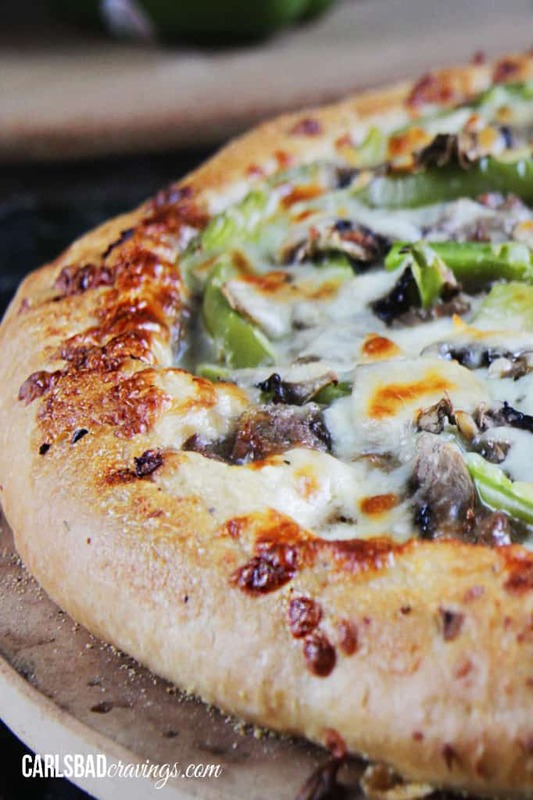 Dig into cheesy, meaty on the inside, crispy, crunchy outside. So no matter if you end up on the winning or losing side of the game, at least you can savor these epic Philly Cheesesteak Egg Rolls along the way. You can either freeze cooked Philly Cheesesteak Egg Rolls or make the filling and refrigerate it until ready to assemble. Do NOT assemble the egg rolls and refrigerate without cooking or else the wrappers will become soggy and tear. 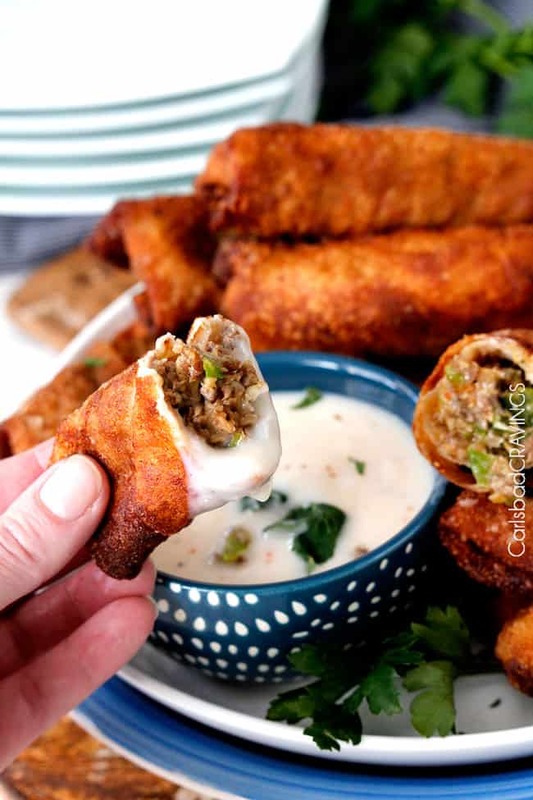 They crispy exterior and hearty filling of these Philly Cheesesteak Egg Rolls are begging to be dipped in a creamy counterpart, and nothing is better, in my humble opinion, than your favorite cheese sauce. I make it easy and just warm up my favorite jar of con queso or even Alfredo. That being said, they are also fabulous dipped in barbecue sauce and even Asian chili sauce! What Should I serve with Philly Cheesestaek Egg Rolls? Looking for more favorite appetizers? 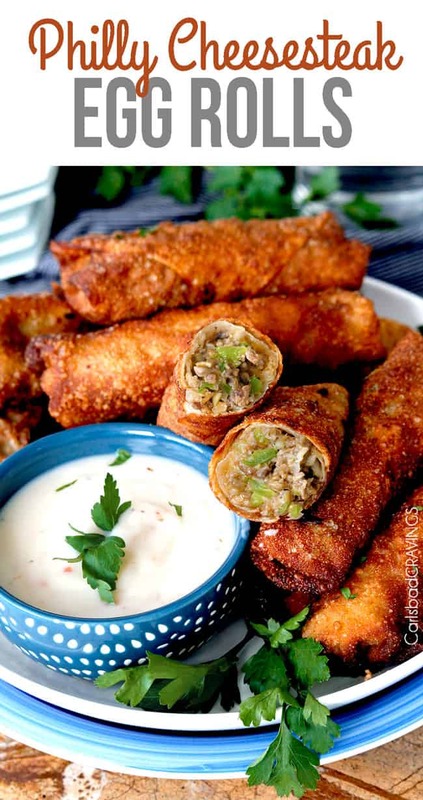 Want to try this Philly Cheesesteak Egg Rolls Recipe? Philly Cheesesteak Egg Rolls loaded with thinly sliced marinated steak, bell peppers, mushrooms and jalapenos smothered with cheese then fried (or baked) to melty, cheesy perfection in a crunchy egg roll cocoon. This Philly Cheesesteak Egg Rolls Recipe might just be the most addicting way to devour Philly Cheesesteaks. Marinate steak with steak marinade ingredients for 1 hour up to overnight. Heat a large skillet on high heat until very hot. Add steak/onions/marinade and let cook on one side without disturbing, then proceed to cook until meat is cooked through. Transfer meat and onions to a fine hole strainer/sieve and remove any excess liquid by pressing down on the meat mixture. Set aside. Wipe out skillet and add 1 tablespoon olive oil. Heat over medium high heat then add mushrooms. Sauté for 3-5 minutes or until golden. Remove to a paper towel lined plate. Heat another tablespoon olive oil over medium high heat and add green pepper and jalapeno. Saute for 1 minute. Add green peppers, jalapenos, mushrooms and steak/onions to a food processor and pulse a few times until roughly chopped. Alternatively, you can chop by hand. Position an egg roll wrapper with one point towards you. Line the center with 2 tablespoons cheese* and top with 1/4 cup steak mixture. Fold bottom corner over filling then continue to roll up, firmly folding sides toward center over filling as you roll. Seal edges with egg wash. Repeat with remaining wrappers and filling. (Refer to your egg roll wrapper for a diagram). To fry (recommended for extra crispiness): Heat oil in a stock pot or deep-fat fryer to 350F degrees or medium high heat. Fry egg rolls, in batches, 3- 4 at a time until golden brown, turning egg rolls a few times while frying. Drain on paper towels. To bake: Lightly spray a baking rack and place it onto a baking sheet. Line egg rolls on baking rack and lightly spray with cooking spray. Bake for 10-15 minutes or until golden at 425F degrees. Serve with your favorite cheese sauce, chili sauce or barbecue sauce with hot sauce to taste. *If you aren't dipping in cheese sauce and/or want more cheesy egg rolls, add more cheese to taste. Hi! I love Philly Cheesesteaks, and I love egg rolls! What a wonderful marriage! I also wanted to tell you that I made your Thai Broccoli Beef and your Baked Sweet and Sour Chicken, and they were big hits! I also think your photography is fantastic! And I love that quote by Elder Uchtdorf about creating. I was going to use the same one on my blog, but I forgot! I am going to follow you all over! These eggrolls just look SO incredible. I love how golden and crispy they are! Thank you so much Thalia! I love a crunchy egg roll! Hi – this looks so good, I am curious on what type cheese sauce you have pictured. All the ones we use are typically Mexican flavored so not sure those will work. We love this idea so any suggestions on the dipping sauce would be most appreciated, thanks! Hi Julie! In the photographs, I am using warmed jarred Alfredo Sauce that I have added crushed red pepper flakes too – super yummy but to be honest, my favorite with these egg rolls is indeed Mexican con queso (Tostitos brand to be exact – might just be because I am in love with it on everything). There are several cheese sauces that are purely cheddar and I have even seen Pepper Jack cheese dip which would also be super yummy. 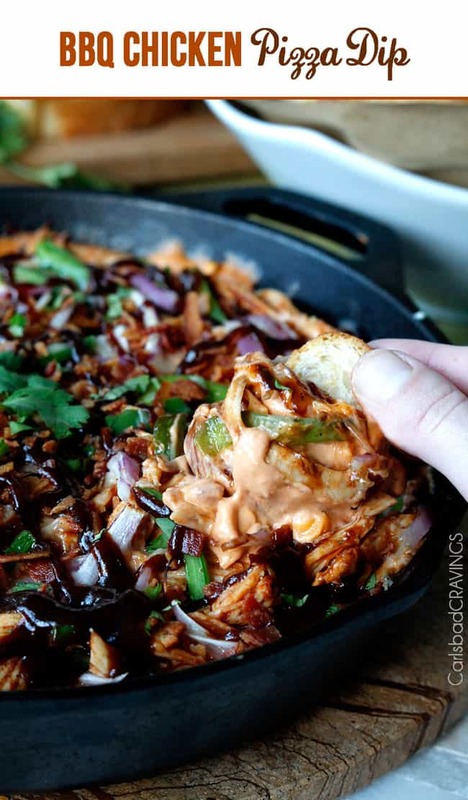 I would simply go with your favorite type of cheese and I don’t think you can go wrong with any Mexican influence because the sauce is still mostly cheese with an added flavor kick. Hope this helps and I hope you love them! Oh man, those look amazing! I love Philly Cheesesteak, and in an egg roll sounds genius! Thank you so much Leia! Just visited your site and love it! What a cute family you have and I love your “Mormon” button – I haven’t seen that on anyone else’s site! I am now following you and excited to stay connected! Thank you so much Leia. It has been a wonderful journey and I feel blessed everyday. Thank you for your kind words! I wish the very best to you and your beautiful family as well! Those are truly STUNNING Jen! Plus, they’re very different from what we’re used to roll up in pastry here in Greece. LOVED it! Thank you Panos and Mirella! I love philly cheesesteak and with the crispy egg roll – they are totally addicting! Philly egg rolls were the bomb! Awesome, thanks so much Marcella! You might just have to eat these and pull your chegan card and then make the Toffee Pecan Caramel Pound Cake while you are at it 🙂 xo! These look incredible. Can they be made ahead and deep fried as needed? Hi Cindy, yes, that would work great! I hope you love them! Hi Jen! I just have to tell you that all of the recipes I’ve tried on your site have been DELICIOUS! I’m really looking forward to making these eggrolls. Quick question…what sauce do you enjoy serving them with? Couldn’t help but notice the delectable one from the photos. Thanks! Okay…upon further investigation of previous posts, I’ve found my answer! 😉 Thank you! Yay! Thank you so much Trisha, I am thrilled you are enjoying my recipes, I love hearing that! I hope you love these too! I just found this recipe. I could be in trouble!!! Can these be pre-assembled and frozen? If so, should I adjust the fry time/temp? Thank you. Hi Karen, yes you can absolutely assemble and freeze these egg rolls. You don’t need to adjust the frying temp but may need to fry them an extra minute or so. Enjoy! Hi Crystal, I’m sorry I don’t have an air fryer so I’m of no help!